I have always been an avid reader of fiction and non-fiction alike, and absolutely love a great book. Within the past 5 years audiobooks have exploded on the scene like never before as the ease of listening has increased exponentially with the introduction of smartphones, tablets, and listening apps. 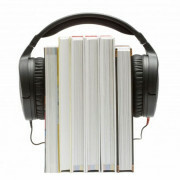 As I listened to books (I still call it “books on tape”) I was fascinated with the voices and narration of the reader. When I started teaching Systems Theory and Business Statistics in 2003 for Bethel University, I narrated the textbook for my students and gave it to them as a CD. These were working adults who had long commutes from work to home and school. This allowed them to “read” the material before class. The class averages rose leaps and bounds. And, I was hooked on the idea. Fast forward to 2013, where as a middle-aged man my acting roles were narrowing on stage and the barrier to narration was falling. No longer were you sending CDs to audiobook publishers – now you were auditioning directly for the authors. I started auditioning and got my first jobs quickly narrating romance novels. In this acting universe of voice I could be male or female, young or old, smart-alecky or sweet. The opportunities to build characters through voice are limitless. It is a great way to fulfill my creative side while looking for behind-the-scenes opportunities with local theatre productions. As I continue to hone my craft in the recording studio and learn about editing, noise floors, decibel ranges, mastering, and other words I had no knowledge of three years ago, I look for projects that engage me, challenge me, and allow for a partnership with the rights holder of the book. My next book is the 6th in a police procedural series called Blood Silence, written by NTY/USA Today Best Selling Author Roger Stelljes. Check out the Mac McRyan Series on Amazon, iTunes, Audible, your local bookstore, or www.rogerstelljes.com.